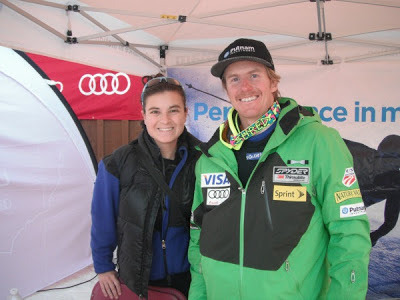 Look who we spotted at the 2012 Audi Birds of Prey World Cup at Beaver Creek. He's a bit unrecognizable sporting his Movember mustache, but that dapper fellow is none other than Ted Ligety, 2006 Olympic gold medalist in the combined (slalom and downhill) and three-time giant slalom World Cup champion. Basically, he's one fast skier--and the favorite to win Sunday's giant slalom race as a fellow fan told me on the bus ride back to the Beaver Creek base. Considering it took me for-ev-er to drive to Beaver Creek (a later-than-planned start, super slow drivers, and overestimating the length of the downhill event), catching Ligety signing autographs and taking pictures in the finish line area completely made up for the action I didn't catch. I missed hiking up to the pumphouse to watch--and feel because they're skiing so fast--the racers whiz by. I missed Aksel Lund Svindal's second place run. I missed Ligety's run--though that might be for the best considering his GS strength and his 31st place finish today (granted he'd still make the super scary top section look easy, like Jonny Moseley on moguls, while I have to timidly ski across the mountain, making some of my most cautious and slowest turns to avoid slipping and skidding on the ice). I missed the rest Team USA's runs--minus Bode, who ruled this downhill last year but has an uncertain ski season ahead. But hey, when you spot a skier, a World Cup skier who you recognize right away, hanging at the finish line--and most of the crowd is heading down the mountain instead of hanging out--you have to stop and say hello. Or clam up and not know what to say beyond, "Thank you!" A "good luck" or an "it's awesome to watch you race" probably would have been better conversation starters.